Bethesda dropped a mountain of information today regarding its upcoming shooter Wolfenstein: Youngblood, along with an absolutely glorious story trailer that shows off the game's co-operative focus and Nazi-killing action. First off, the latest entry in the Wolfenstein series now has an official release date in July 26, 2019, with the standard version of the game (which doesn't seem to be available outside of the US) priced at $29.99, and the Deluxe Edition priced at $39.99 (£34.99 / AU$69.95). Further stressing the importance of co-op in Youngblood, Bethesda also announced that the game's Deluxe Edition will come with a 'buddy pass' that will allow players' friends to join them without having to purchase their own copy (a similar feature was previously offered in EA's game A Way Out). Buddy passes may also be given out to multiple friends, however, only one person may play along with the game's owner at any given time. The Deluxe Edition will also provide players with a cosmetic Cyborg Skin Pack, which has been "designed to give you that titanium Terminator look," as well as "a shiny new skin for the twins’ Power Suits, guns, combat knives and hatchets." Every pre-order of the game (either standard or deluxe) will also receive a Wolfenstein Legacy Pack, which contains a Wolfenstein II: The New Colossus jacket power suit, BJ’s US Army power suit, the Wolfenstein: Old Blood pipe, the Wolfenstein: Old Blood knife and a WW2 weapon skin set for all ranged weapons. Set in Nazi-occupied Paris during the 1980s, Wolfenstein: Youngblood sees our usual protagonist, BJ Blazkowicz, missing in action, leading his twin daughters, Jess and Soph Blazkowicz, to set off on a mission to find him. Thankfully, the girls take after their old man when it comes to violently dispatching Nazis. 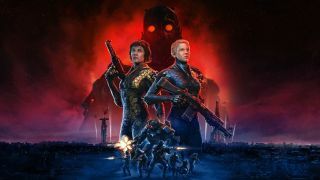 Wolfenstein: Youngblood will release on Xbox One, PlayStation 4, Nintendo Switch and PC. You can check out the game's blood-drenched, cuss-filled and Carpenter Brut-scored story trailer below.